If towing is necessary, we recommend you have it done by an authorized HYUNDAI dealer or a commercial tow truck service. If towing service is not available in an emergency, your vehicle may be temporarily towed using a cable or chain secured to the emergency towing hook at the front (or rear) of the vehicle. Use extreme caution when towing the vehicle with a cable or chain. A driver must be in the vehicle to steer it and operate the brakes. Place the shift lever in N (Neutral). Depress the brake pedal with more force than normal since you will have reduced braking performance. Use a vehicle heavier than your own to tow your vehicle. Use a towing cable or chain less than 16 feet (5 m) long. Attach a white or red cloth (about 12 inch (30 cm) wide) in the middle of the cable or chain for easy visibility. Drive carefully so the towing cable or chain remains tight during towing. 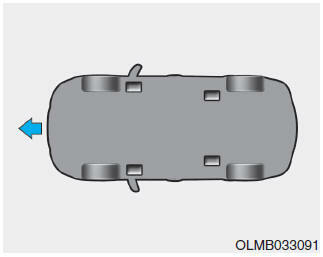 Before towing, check the automatic transaxle for fluid leaks under your vehicle. 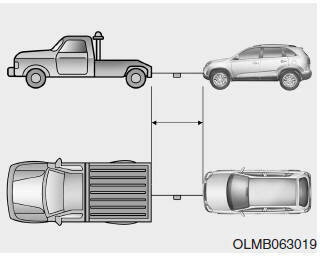 If the automatic transaxle fluid is leaking, flatbed equipment or a towing dolly must be used. Always pull straight ahead when using the towing hooks. Do not pull from the side or at a vertical angle. Limit the vehicle speed to 10 mph (15 km/h) and drive less than 1 mile (1.5 km) when towing to avoid serious damage to the automatic transaxle. 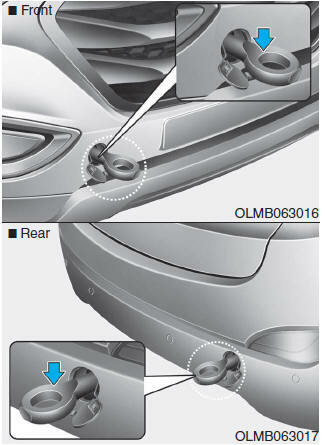 Do not use the tie-down hook(s) for towing purposes. If the tiedown hook(s) are used for towing, the tie-down hook(s) or bumper will be damaged and this could lead to serious injury.